This Ready to Ship Table Skirt is Made from Polyester to Last through Many Uses! Pick the Color that Appropriately Matches the Decor of an Upcoming Reception! Browse the Vast Table Skirt Collection Today to Find High Quality Covers! 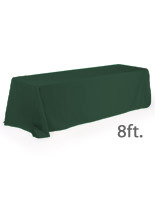 Four-sided cloth is designed to cover all (4) sides of any 8' rectangular table. Features rounded edges for adding an attractive touch to your table! 100% Polyester fabric is wrinkle-resistant and machine washable. 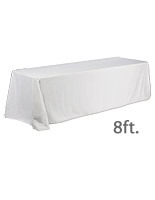 This cover, table skirt is made of 100 percent polyester, which is a durable and wrinkle-resistant material. The solid color and modern design of this throw will bring life to any table you choose to adorn. 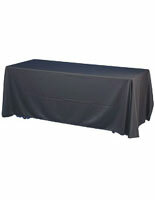 This polyester cover, table skirt is four-sided and has rounded corners that fit perfectly on any 8' rectangular table. The one-piece linen drapes within 1" of the floor on all four sides. 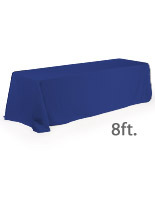 If you are presenting any brochures, samples, or freebies, you may need this table skirt to hide the legs of your display tables. 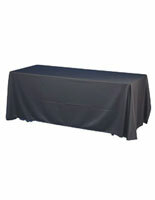 A table skirt, like polyester throws and linen covers, may be used for both formal and casual settings. Within seconds, your unattractive surface will look more professional and presentable to attendees. 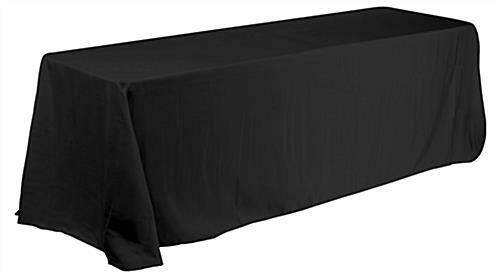 The full draping table skirt hides table feet and allows you to store boxes, accessories, and extra literature underneath. 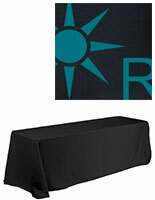 A banquet throw is ideal for use at school assemblies, trade shows, and upscale eateries. You can use table skirt alone or mix and match them with other runners for additional appeal.